Not a fan of Brussels sprouts? 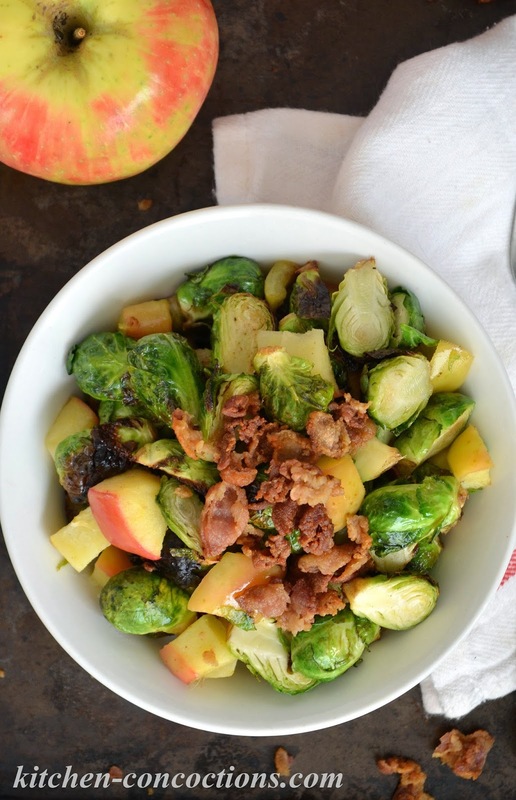 Give them a second chance and try these Roasted Brussels Sprouts with Apples and Bacon. 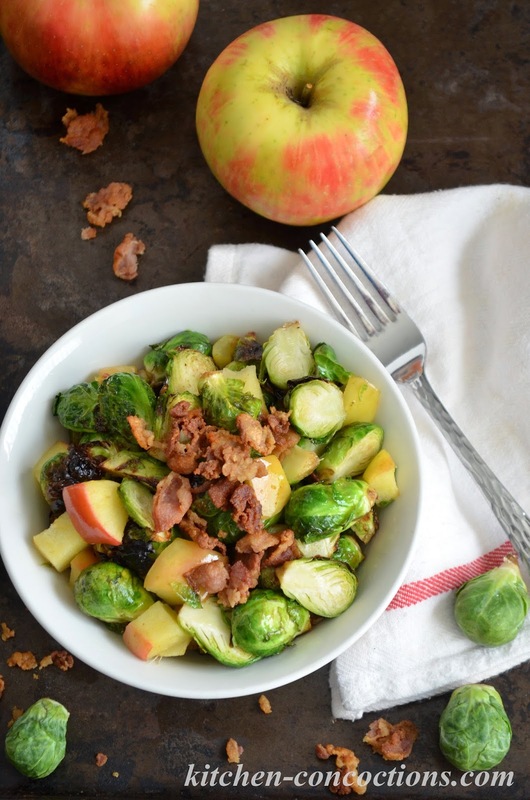 These crispy, caramelized Brussels sprouts tossed with sweet apples and smokey bacon will surely become a fall favorite! When I first started blogging I had absolutely no direction. I just blogged whatever (as long as it had something to do with food), whenever I could. After about the first year I finally started finding my voice and was a little bit more focused. I had grand ideas of posting on a regular schedule and had special features I wanted to start. Slowly these ideas started to become a reality. I found time to post regularly, posting 3-5 times a week. I started my cookbook of the month series which transformed into a magazine and website of the month series. I had a blogger spotlight series call “Bites with Bloggers” and did recipe round ups. I also had blog posts were I shared cooking basic ‘how-tows” and shared “crafty concoctions”. I have spotlighted many different seasonal ingredients and shared a “foodie field trip” or two. Not to mention the hundreds of recipes I have shared all along the way! Of course the main purpose of this blog has always been to share my old family recipes as well as the adventures (and sometimes misadventures) as I learn and try new recipes and cooking techniques. I have always loved it all. Simply sharing recipes and stories to all the special features. But this is a one woman show and blogging, every little detail that is involved in the process, is a lot of work. A work, of course, that I love! And the last two years I feel like I have been more busy than ever. With life. With the couple of contract jobs that are my main source of income. With trying to balance it all. But I have missed all those special things. I have missed getting a new cookbook and pouring over it and analyzing every detail. I have missed reaching out to my fellow bloggers and sharing their story. And I have especially missed my ‘theme weeks,” where I pick an ingredient or holiday or cooking technique and highlight it by featuring it in a series of blog posts (mostly recipes, but FYI articles and sometimes crafts) for one whole week. As I try to balance life, work and my passion and love for this blog; I hope to bring back some of those special features that I have always enjoyed sharing…. like those special theme weeks! This week is the first theme week I’ve had in a long time and it is to highlight my current favorite fall food… apples! Yesterday, I shared a quick, easy, (almost) all-in-one slow cooker meal. I say almost, because while that recipe has pork loin, apples and sweet potatoes; I strive to have some sort of green veg or salad with every meal. These Brussels sprouts have become our new go to side dish. Yes! Brussels sprouts are our current favorite vegetable! 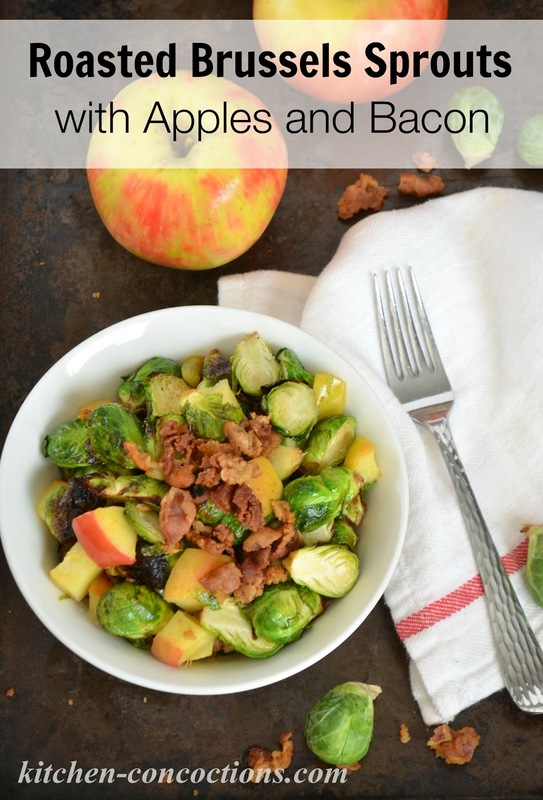 With the addition of bacon and apples all roasted to perfect… I dare all you Brussels sprout haters to give these a try! 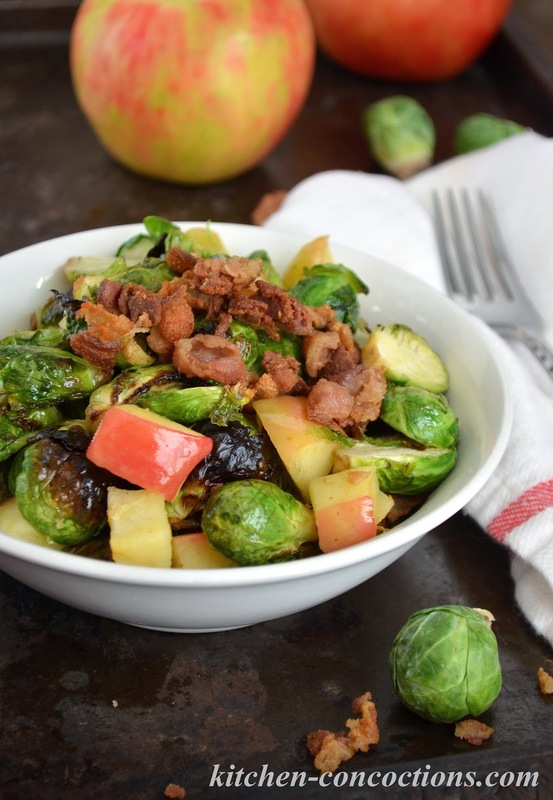 Crispy, caramelized Brussels sprouts tossed with sweet apples and smokey bacon. Preheat oven to 450 degrees. Line baking sheet with foil and set aside. Chop raw bacon into bite sized pieces. Heat a large skillet over medium-high heat. Add bacon and cook until crispy, about 3-4 minutes. Using a slotted spoon transfer bacon to a paper towel lined plate and set aside. Drain all but 1-2 tablespoons of bacon grease from skillet. Return skillet to burner and add Brussels sprouts and apples. Cook Brussels sprouts and apples for 1-2 minutes over medium-high heat. Transfer Brussels sprouts and apples to prepared baking sheet and season with salt and black pepper. Roast Brussels sprouts and apples in preheated 450 degree oven for 10-15 minutes or until golden brown. Serve immediately topped with crispy bacon. Serving suggestions: Since Brussels sprouts are in season in the fall and winter months, they would complement this Slow Cooker Pork Loin with Apples and Sweet Potatoes or Brown Butter Pumpkin Mac and Cheese perfectly.